My Quilt Infatuation: NTT- It's the Place to Be! I finished up Grapefruit Fizz on Sunday and until this evening, I had gotten zero sewing done since. Nope, nada. Not a single stitch. I think it's because I've decided that it's finally time for me to use this little bundle of Riley Blake Daisy Cottage, and I'm just not truly in love with it. That, and my life has been madness these last few days. One or the other. In truth, I wasn't absolutely in love with this bundle when I got it, but I found it on sale (isn't that always the way), and I thought, "Well, it's nice, and will make a cute little baby girl quilt." And I went ahead and bought it. So, I went round and round with myself about what I should do with this fabric, and I decided to make another giant log cabin. They're quick to cut, speedy to sew, and totally stress-free. And it means I can use up this bundle fast, and without a lot of fuss. I finally got some time at my machine tonight. I spent about 15 minutes cutting and one hour sewing up this baby quilt. One hour, y'all- seriously. That's my kind of quilt top- which, by the way looks way better in person. I do think it's a sweet little quilt, but still...lesson learned. Only buy fabric if you truly love it. Am I the only one who's done this?? Oh, and one other thing!! I'm sad to say that Vickie, the winner of the FQ bundle giveaway never responded back to me when I emailed her, so wild thing picked another random number. The lucky winner is number 23- Lisa Cox! Lisa, I'll be emailing you soon so I can ship out those FQ's ASAP! Now, check out some of the awesome link ups from last week! 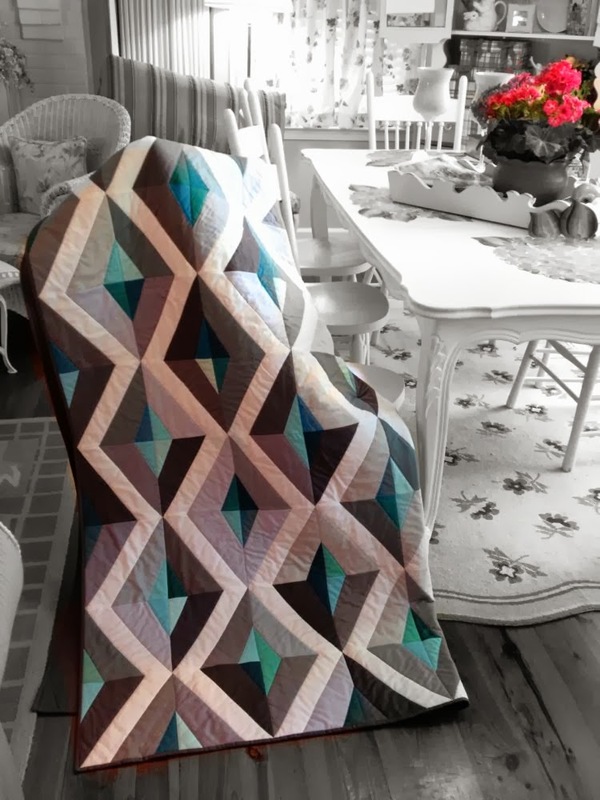 Paula, The Sassy Quilter revealed this breathtaking Prism quilt! What a beauty! Y'all know I'm a sucker for Swoon quilts, and this one by Izzy at Dizzy Quilts is just gorgeous! 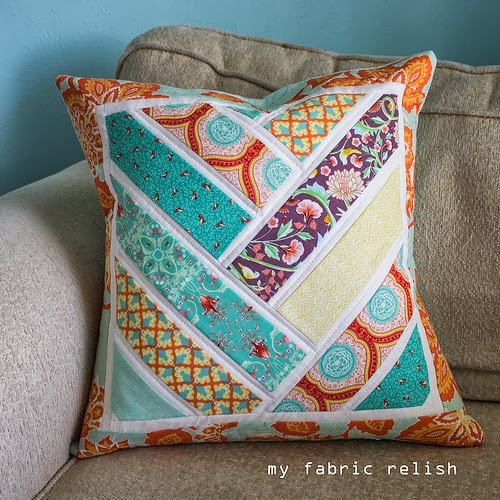 and Melissa at My Fabric Relish shared her broken herringbone quilt progress along with this awesome pillow! That will be one treasured baby girl quilt when you get her quilted up, Kelly. And those are sweet fabrics. I find quilts always look way better in person than in pics, too. And I have to agree... NNT is the place to be! Well, I think the baby quilt is beautiful! The giant log cabin is a great design Kelly! I like those fabrics and I think the result is great! I just discovered your blog this week and I love it! I love your pink quilt also. That will be a fun one to quilt :). I understand your feelings...but actually, all week I've been trying to think of a pattern to make a quick boy baby quilt...bam! NOW I know what I'm going to make....a LARGE log cabin....thanks for the continued inspiration. thanks so much for showing off my pillow today! I love linking up here! :) ps - I like the rhyming...I think you should keep it. every week. Aww, thanks Kelly! Tomorrow I see how I did at the fair and I can barely stand it, lol. Love the log cabin. I need to try one of these, sounds super quick and that sounds good. Got my chevron HST's done and going to piece em up tonite:) Yay! I love it.It`s beautiful.Happy sewing! Beautiful baby quilt...and only an hour!? Perfect. 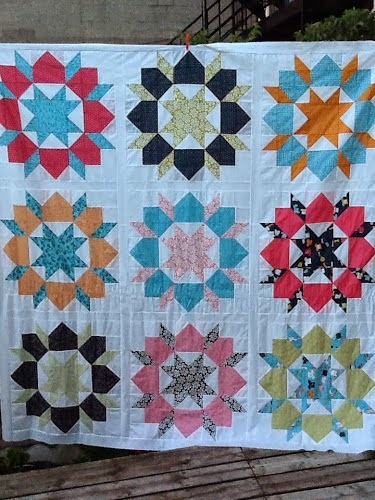 Thank you so much for showing my Swoon quilt Kelly! :-). I really like that giant log cabin quilt... The colours are really sweet. I do like the brown with the pink. That is a colour I rarely use, but it looks great here. I got stuck with a bundle that I wasn't in love with but only once! I tried to make it work but still didn't love it. I know someone else will eventually love it but it's even hard for me to donate something that doesn't make my heart go pitter patter! Thanks for blogging. You are always a good read during my lunch hour. I get lots of ideas (and I've told my dad to save his shirts -- they are COLORFUL). Kelly I love this little quilt. I am the same way. If I don't love what I am sewing it is so hard to finish and I usually end up second guessing myself. This is really cute though.